What is unique about the Pierce House? The Pierce House is a residential care facility in a vibrant downtown area, nestled among the lakes and mountains of Western Maine. We are within walking distance of the University of Maine at Farmington, churches, library, banks, post office, shops, and restaurants. The Pierce House is operated by an experienced and caring staff who are supported by a large group of community and student volunteers. We provide wireless computer access in each room, as well as a common computer station available to all residents, and we maintain a high-tech security system. We offer a variety of community projects and activity programs that meet individual needs. 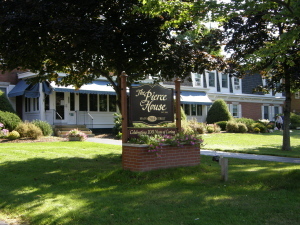 The Pierce House is a non-profit organization that contributes to its costs of operation from its own endowment. Our monthly rates are below market prices, and include all services and meals.